a collaborative project of poems and drawings based on text redactions of The Book of Earths, by Edna Kenton, a compendium of theories of the shape of the Earth, and its surrounding folklore. While the project is rooted in analog works, specifically poems by Justin Petropoulos and ink drawings by Carla Gannis, it grows these texts and images into digital paintings, animations, projection mapped & 3D printed sculptures, as well as interactive works. The project’s title, <legend> </legend>, is an empty html tag. The viewer/reader must complete the meaning themselves. The definition of the legend is determined by the movement within ones own cartographies. You can alter the text, then the image will response to the text you created. After that you can publish it in their bookvia a tweeter feed. Carla Gannis is an artist who lives and works in Brooklyn, New York. She received a BFA in painting from The University of North Carolina at Greensboro and an MFA in painting from Boston University. In the late 1990s she began incorporating net and digital technologies into her work. Gannis is the recipient of several awards, including a 2005 New York Foundation for the Arts (NYFA) Grant in Computer Arts, an Emerge 7 Fellowship from the Aljira Art Center, and a Chashama AREA Visual Arts Studio Award in New York, NY. She has exhibited in solo and group exhibitions both nationally and internationally. Her solo exhibitions include “<legend> </legend>” (in collaboration with Justin Petropoulos) at Transfer Gallery, Brooklyn, NY, “The Multiversal Hippozoonomadon & Prismenagerie” at Pablo’s Birthday Gallery, New York, NY; “The Non-Facial Recognition Project” at Edelman Gallery, New York NY; and “Jezebel” at The Boulder Museum of Art, Boulder, CO. Features on Gannis’s work have appeared in NY Arts Magazine, Res Magazine, Animal, 11211, and Collezioni Edge, and her work has been reviewed in Hyperallergic, Art Critical, The New York Times, The LA Times, The Miami Herald, The Daily News, The Star Ledger, and The Village Voice. Justin Petropoulos is the author of the poetry collection, Eminent Domain, selected by Anne Waldman for the “2010 Marsh Hawk Press Poetry Prize”. His poems have appeared in American Letters & Commentary, Borderlands: Texas Poetry Review, Columbia Poetry Review, Crab Creek Review, Gulf Coast, Mandorla, Portland Review, and most recently in Spinning Jenny. Petropoulos holds an MFA in Creative Writing from Indiana University. He co-curated “Triptych Readings” from 2010 to 2011 and was a guest blogger for Bryant Park’s summer poetry reading series, “Word for Word”. Currently Petropoulos is the site director of an after-school program for elementary age children and is an adjunct faculty member at New Jersey City University. He lives in Brooklyn, New York with his partner in crime, interdisciplinary artist Carla Gannis. Visit him on Twitter at @redactioneer or at Marsh Hawk Press. 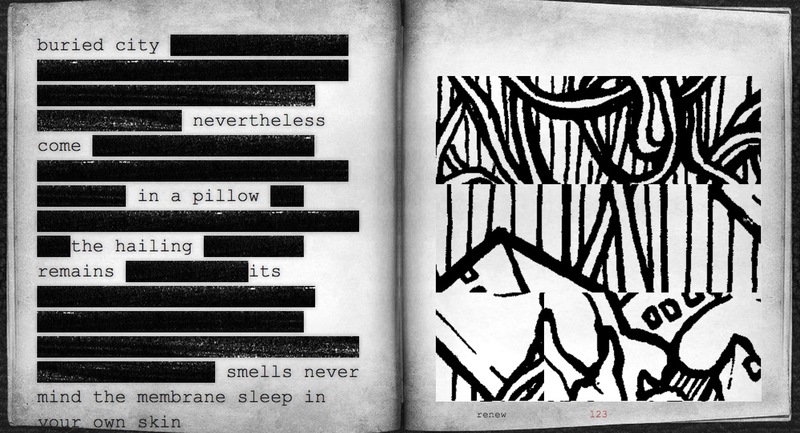 A page from an interactive book artwork inspired by Ralph Ellison's book "The Invisible Man". Ellison's book was banned by a school library after a student's mother complained about the adult content in the book. One board member supported her complaint, stating that he "didn't find any literary value" in Ellison's account of African-American alienation in the United States in the early 20th century. Choose a section of text that has not been recorded. Record the text on an iphone, portable recorder, or straight into your computer. 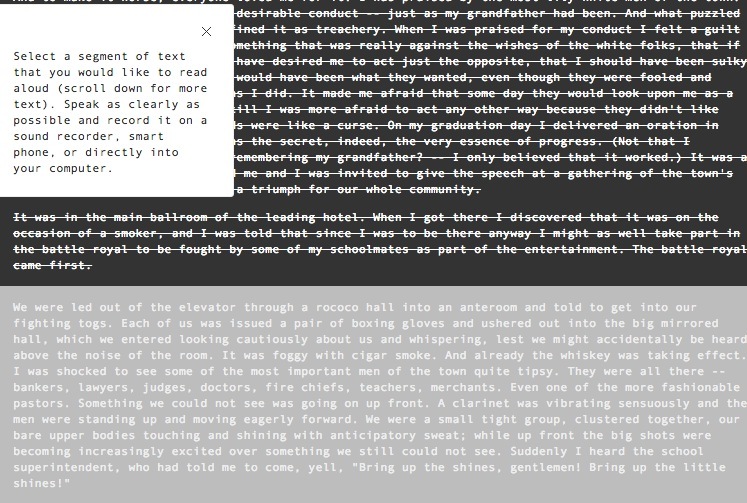 Visitor can go in, read aloud the text that is available, upload their sound file to the project as said above in the "contribute" and listen to the piece they added. Evolution is an online artwork-in-progress designed to emulate the texts and music of poet and artist Johannes Heldén, with the ultimate goal of passing “The Imitation Game Test” as proposed by Alan Turing in 1951. With Evolution we aim to examine and dissect the role of the author; when new poetry that resembles the work of the original author is created or presented through an algorithm, is it possible to make the distinction between “author” and “programmer”? And is it even relevant? Evolution is an online artwork-in-progress designed to emulate the texts and music of poet and artist Johannes Heldén, with the ultimate goal of passing “The Imitation Game Test” as proposed by Alan Turing in 1951. With Evolution we aim to examine and dissect the role of the author; when new poetry that resembles the work of the original author is created or presented through an algorithm, is it possible to make the distinction between “author” and “programmer”? And is it even relevant? When the work of the algorithm is extrapolated to the point where the original author becomes redundant, how does this affect copyright, legacy, future writings, etc ? The purpose of the work is not to deromanticize or deconstruct the role of the author, but is rather the ongoing exploration itself. Where will it take us, and perhaps more importantly, what will happen along the way? The release of Evolution will mark the end of Johannes Heldén writing poetry books. He has, in a sense, been replaced. Johannes Heldén is an author, visual artist, musician. He is the author of eleven books, most recently Evolution and Terraforming(OEI); five digital works, most recently The Factory (Möllebyen Literature) and Evolution Digital (w/ H. Jonson, premiered at the Centre Pompidou, 2013); three music albums, most recently System (Irrlicht, 2013). Solo exhibitions include: the Media Archaelogy Lab in Boulder, Bonniers Konsthall in Stockholm, Gothenburg Museum of Art, Volt in Bergen, Norway, amongst others. Group exhibitions include Remediating the Social at Inspace, Edinburgh, Against Time at Bonniers Konsthall, NIMK, Amsterdam and Chercher le texte at Centre Pompidou. Grants and awards: the N. Katherine Hayles award, The Kalleberger Grant, Hawthornden amongst others. This entry was posted in Book Merah, SPOKEN and tagged art, authors, Nhung Walsh, SPOKEN. Bookmark the permalink.